Welcome to the sarishop. We want to show off the saris of India, not just because they are beautiful, entrancing, a length of cloth that can be glamorous beyond belief, or humble and plain. We are struck with the SHEER VARIETY of handloom cloth that is still being produced in this modern world. 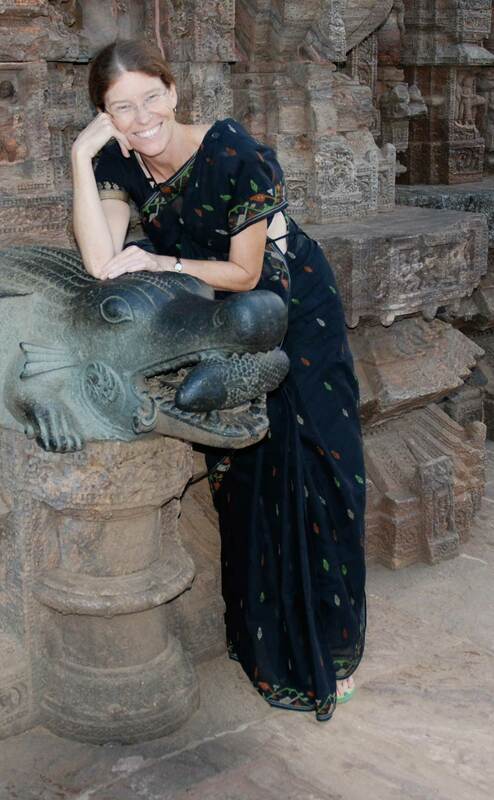 Melinda at Konarak Sun Temple in Orissa. Many of the pieces we carry are hard to come by. We really go out of my way to get the obscure stuff, to sleuth out new things we've never seen, learn about them and share what we learn. There is no other cloth on earth as widely varied in style, ornamental structure, fiber qualities, weave, print or embellishment technique as the Indian sari. Why shop at Sarisafari's Sarishop? If you compare Sarisafari with other sites selling sarees on the internet, you'll see many differences. The Sari Safari Sarishop is structured region by region with a mind boggling variety and selection. We hand select each and every piece out of thousands - distilling the selection to the most beautiful and harmonious of each style. The Sarishop is not just a store, it's a learning experience and a travel story! Our mission with this venture is to preserve the weaving traditions of India. They are enough to sustain a fabric junkie for a lifetime. Please contact arathi@sarisafari.com or message us on our Facebook page, Sarisafari with your comments and suggestions. We welcome your thoughts and look forward to hearing from you.